Kurdistan and Catalonia: Two very different places learn how hard it is to start a new country. 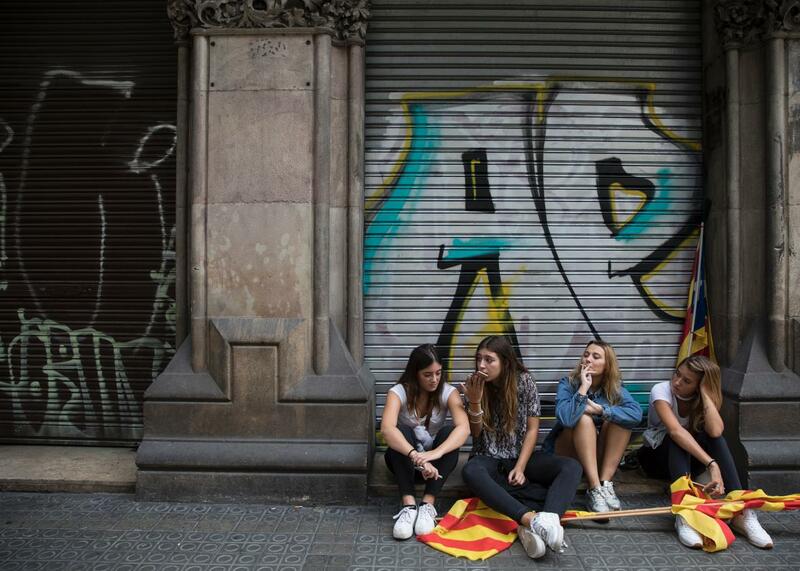 A group of demonstrators take a break from a march in front of a closed shop during a regional general strike to protest against the violence that marred Sunday’s referendum vote on Tuesday in Barcelona, Spain. More than a week on from its independence referendum, Kurdistan remains in limbo. Its leaders have not unilaterally declared independence and have no plans to do so, but the Shiite Arab–led Iraqi government in Baghdad has rejected calls for negotiations on independence and imposed a ban on international flights to the region’s two main airports. The Iraqi Parliament is calling for the government to send troops to disputed Kurdish-controlled regions. Neighbors Iran and Turkey, which are seeking to tamp down nationalist aspirations among their own Kurdish populations, have backed Baghdad, though Turkey has not yet followed through on threats to cut off the cross-border flow of oil and trucks, Kurdistan’s economic lifeline to the outside world. In the end, the referendum seems to have been a short-term political gain for Kurdish Regional Government President Masoud Barzani, who has called for new elections on Nov. 1, but hasn’t gotten the Kurds any closer to internationally recognized statehood. The current tensions may simmer down, but Kurdistan will still be stuck as a not-quite-country for the foreseeable future. Unlike the Kurds, Catalans have not been victims of genocide or recently taken up arms against their government, but the aftermath of the referendum there turned out to be far more chaotic and violent, as national police stepped in, using truncheons and rubber bullets to shut down a vote viewed by Madrid as illegal and unconstitutional. Pro-independence groups and unions called a general strike Tuesday and protests have broken out throughout the region. It’s a striking contrast with Europe’s previous major separatist challenge, Scotland’s 2014 independence vote, during which the British government peacefully and successfully made the case for keeping the United Kingdom united. More than 90 percent of those who took part in the referendum voted yes, though the turnout was only 42 percent, and it’s likely that most opponents of independence stayed away from the polls. Nonetheless, Catalan leader Carles Puigdemont has declared the vote valid, and could declare Catalonia’s independence within days. * The level of political breakdown on display here is something new and unprecedented for a Western European democracy in recent years. Pro-Russian media and trolls were also heavily deployed in the run-up to the referendum, giving favorable coverage to the separatists and drawing parallels to Crimea’s controversial 2014 referendum to join Russia. As with other Russian info operations, including the one during the last U.S. presidential election, these meddlers didn’t create the fissure so much as exploit tensions that were already there, in this case to undermine European unity. Spain’s heavy-handed response to the referendum is likely to only exacerbate these tensions, bolster the case of the separatists, and make it easier for outside actors to exploit the resulting divisions. *Correction, Oct. 3: This post originally misspelled the name of the leader of Catalonia.